Traditional open approach is an efficient way to treat lumbar spinal stenosis (SS) combined with disk herniation (DH); however, risk factors such as advanced age, osteoporosis etc. are associated with the complications after the surgery. This study aims to analyze the early clinical and radiological outcomes of treatment on SS&DH by using newly developed minimal invasive TESSYS-ISEE technique. 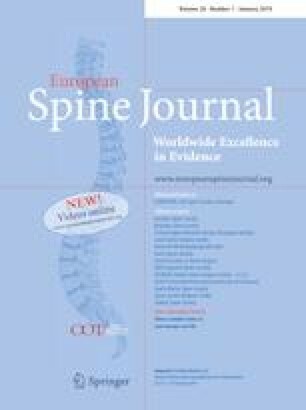 Patients with limp and unilateral lower limb radiculopathy underwent minimal invasive surgery by using TESSYS-ISEE technique. 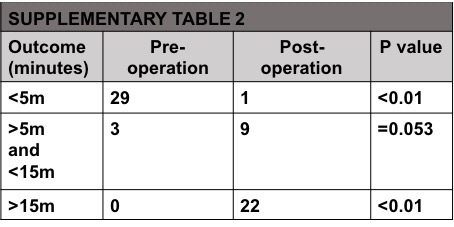 The visual analogue scale score (VAS) and Oswestry Disability Index (ODI) were evaluated before operation and 1, 3, 6 and 12 months after surgery. The clinical global outcomes were also evaluated using modified MacNab criteria after surgery. A total of 32 cases underwent operation by using TESSYS-ISEE technique from December 2016 to December 2017. The mean age for the study group was 53.9 ± 11.14 years and the ratio between male and female was 1.29:1; Mean follow-up of the study was 7.78 ± 3.48 months and mean estimated blood loss was 11.41 ± 4.79 mL per-level. VAS leg score improved from 8.44 ± 0.98 to 2.18 ± 0.75 (P < 0.001), VAS back score improved from 4.44 ± 0.95 to 1.57 ± 0.54 (P < 0.001), and ODI improved from 73.88 ± 5.95 to 29.04 ± 7.48 (P < 0.001). The success rate was 90.7%. There were no serious complications during follow-up. Two patients experienced dysesthesia and one patient required revision surgery. It is safe and minimal-invasively to treat SS&DH by using TESSYS-ISEE technique. However, potential complications still require careful consideration and further evaluation. These slides can be retrieved under Electronic Supplementary material. The online version of this article ( https://doi.org/10.1007/s00586-018-5655-4) contains supplementary material, which is available to authorized users. This work is supported by the Natural Science Foundation of China (Grant No 81401802) and the funds from National Health and Family Planning Commission of Wuhan Municipality and China Postdoctoral Science Foundation (Grant No 2016M593043). CX and FX worked on conception and study design. HK and HH performed the operation. CX played a role in data analysis and interpretation. TL and JH drafted the manuscript. All authors played a role in critical review and revision of final manuscript for important intellectual content. No conflict of interest was declared.